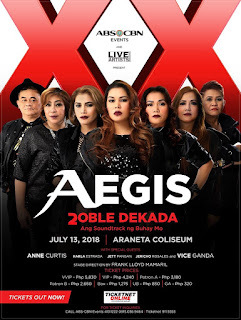 Phenomenal Pinoy band Aegis celebrates its 20th year in the music business with a major concert dubbed as “AEGIS: Doble Dekada, Ang Soundtrack ng Buhay Mo” on July 13 at the Araneta Coliseum. The ABS-CBN Events production will feature artists Jett Pangan, Jericho Rosales, Karla Estrada, Anne Curtis, and Vice Ganda rocking the stage with the iconic band. Frank Lloyd Mamaril is set to direct the show. 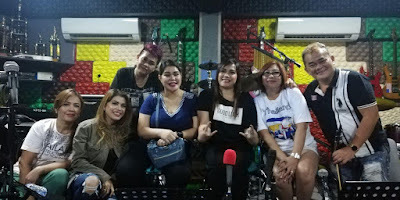 Aegis is also known for its sell-out and outstanding concerts. In 2017, the band won the “Best Major Concert” award at the 30th Annual Aliw Awards for its “Aegis Na Aegis: A Story of Us” show. Tickets to the OPM great’s “AEGIS: Doble Dekada, Ang Soundtrack ng Buhay Mo” concert are priced at P5,830 (VVIP), P4,240 (VIP), P3,180 (Patron A), P2,650 (Patron B), P1,275 (Box), P850 (Upper Box), and P320 (General Admission). For inquiries, contact ABS-CBN Events at 413-1222/0915-036-9464 or Ticketnet at 911-5555. Information may also be found on ABS-CBN Events’ official social media accounts at Facebook.com/ABSCBNnetwork/events or @abscbnevents on Twitter and Instagram.